Michael, Bobby, Ricky, Ronnie, Ralph and Johnny. Those are the names synonymous with the best male R&B group ever. Of course there's the Jackson 5, Dru Hill, Jodeci, Jagged Edge, -- and Boyz II Men, (who ironically was founded by a Michael and named after one of their hit songs), can lay legitimate claim to that distinctive honor. They have come and they have gone, but so many people remember who they are simply by the melodies they created that are all time. When you think of those slow songs that either put you in the mood or make you feel some type of way, they are the go to guys. And when it comes to the distinctive sounds of what an all male at should sound like, no one is touching them, at all. There's so much to be said about their rise and their fall, but I'm not here to talk about that today. What I am here to talk about his how they impacted me and the way I listen to music. Long before there was Beyoncé, dancing and singing on stage like it was nothing, New Edition burst onto the scene, doing the same thing. In fact, in perhaps in my favorite music video outside of One More Chance Remix, was their music video for If It Isn't Love where they displayed just how awesome their choreography was. There are a ton of songs I could rail off for you that these guys have made that has affected me in some form or fashion. To sit here and go over them all would literally take me a couple of thousand of words lol. But to cut myself short from doing so I want you guys to go to whatever music streaming service you have or buy the CD's from whatever website you can find them at and just listen to how they all connect with their voices and how they all feed off of each others energy. There are few groups ever to have that kind of synchronization with each other. 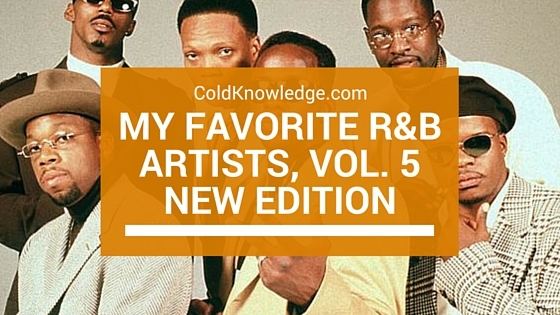 They are legends in their own right and they ushered in that 90's R&B sound that everyone loves to hear so much. Whether you love them or hate them, they are truly something special to hear.